While some coastal areas in Staten Island cope with the devastation of Sandy, the city is moving ahead with a public meeting tonight about a parking-saturated mega-development for the north end of the island. According to one developer, the project will include “every possible bit of parking” that can be built there. At the same time, the developers will contribute nothing to improve surface transit to the site, even though it is located in the most transit-accessible part of Staten Island and the MTA is planning a new busway that will directly serve the area. The city’s proposal to build a 1.46 million square-foot regional shopping, entertainment, and hotel complex in St. George would concentrate development in a transit-accessible location and improve pedestrian connections between Richmond Terrace and the waterfront. But these benefits stand to be overshadowed by a huge amount of parking — 2,200 spaces — that will disrupt the pedestrian environment and attract street-clogging car trips. The project will include between 50 and 125 retailers, a 200-room hotel, waterfront restaurants, a banquet facility, and — who could forget? — the world’s largest ferris wheel. Today, the site has 1,606 parking spaces, according to the New York City Economic Development Corporation: a 230-space EDC lot southeast of the Staten Island Yankees stadium, two DOT commuter lots totaling 556 spaces at the Staten Island Ferry terminal and an 820-space EDC lot northwest of the ballpark. The complex as currently proposed would include 2,200 parking spaces, which is intended not only for visitors to the new development but also Staten Island Yankees fans and ferry riders, according to EDC. “All the parking spaces that were removed for these developments will be replaced, and then some,” Mayor Bloomberg said at the press conference announcing the development. “We’re kind of hoping that demands at certain hours of the day will offset each other,” Joe Ferrara of project developer BFC Partners told the Staten Island Advance. Streetsblog reached out to BFC for more information but has not received a reply. 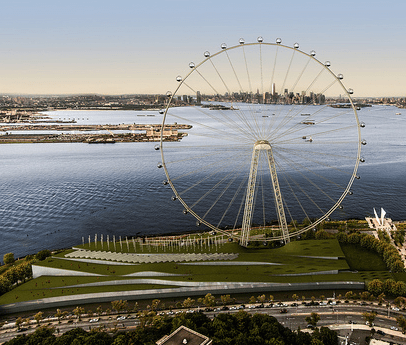 A three-level garage on the “south site” (the retail-hotel complex near the ferry terminal) will have 1,250 spaces, while 950 (plus 20 spaces for buses) will be in a garage on the “north site,” which will have additional retail and restaurant space and the New York Wheel. The project’s north site is seeking LEED Platinum certification from the U.S. Green Building Council to be designated as one of the nation’s most environmentally-friendly new buildings. The development would deck over but not eliminate the 50-foot wide rail right-of-way designated for a proposed North Shore busway. It does not include any improvements to facilitate transit service along the North Shore rail corridor. The MTA says the shopping, entertainment, and hotel complex has not figured into planning for the new transit route, and it does not expect the new development to affect ridership. Even without the proposed busway, St. George is the single most transit-accessible place on Staten Island. The project’s draft scope of work, which describes the complex as “transit-oriented development,” calls the neighborhood “a transportation hub of rail and ferry service for Staten Island,” served by the Staten Island Ferry, Staten Island Railway and 22 bus lines. “The idea is to make St. George an area where you don’t need a car,” Staten Island Borough President James P. Molinaro told the Post. But the project’s huge amount of parking undermines that goal, and the developer says existing transit service isn’t enough to encourage Staten Islanders not to drive. “We’re assuming that the Staten Island population, especially the South Shore, will be driving over,” BFC’s Ferrara told the Advance. But as a borough, Staten Island has lower car commute rates than Portland or Los Angeles. NYC EDC and the Department of City Planning have a long track record of building unnecessary parking and subsidizing it with taxpayer dollars, though in this case, at least, public officials have made a point of saying that the St. George development will not receive any subsidies. For this project, EDC put together the “request for expressions of interest” from developers and negotiated the lease of the site, while the City Planning Commission will have to approve the high volume of parking. Instead of supporting a development with 2,200 parking spaces, which will lead to more driving and traffic congestion, the city could have trimmed down mall parking in what is already the island’s most transit-friendly neighborhood and used the development to help advance the MTA’s planned transitway instead of simply decking it over. The only increased transit capacity proposed by the project is a new dock and water taxi, but EDC’s planning documents are noncommittal about whether these will be part of the final development. The development’s parking facilities need special permits from the City Planning Commission, and the project must also navigate the city’s environmental review process. The first public meeting will be held today at 6:00 p.m. in the Music Hall of the Snug Harbor Cultural Center and Botanical Garden at 1000 Richmond Terrace. It will be followed by a 10-day public comment period. EDC expects to complete the review process and begin construction in early 2014, with the complex opening by 2016. If I’m reading this right, the 1.46 million square feet of additional space will come with 594 additional parking spaces, for an average of one space per 2,460 square feet. Which is a rock bottom level by the standards of the now-fading auto era. They may or may not be needed. And “taxpayer subsidized’ is not what I want to hear. But “in this case, at least, public officials have made a point of saying that the St. George development will not receive any subsidies.” So I’m not going to get all upset about it. Perhaps there is something to ask for to make Streetsbloggers feel better. How about this? The 556 parking spaces closest to the ferry, or at least most of them, should be set aside for vehicles that have three or more people on the way in, and three or more people on the way out. Set up a text message system to link up drivers with prospective passengers traveling to and from the ferry from their neighborhoods. Imagine what *actual* transit-oriented development in this area could do for Staten Island’s future livability. Instead we’re going to permanently make the area with the greatest potential a driver’s haven – and probably sink the future of auto-free livability for the entire borough. Shameful. And it’s inconceivable that for all the long-term damage it would do, it would then get a LEED designation at all. Maybe if this was in Dallas, but here? Ferry riders will not be driving because the boats have not carried cars since 2001, so a few hundred of those parking spots are unjustified. However, the boat carries many bicyclists looking to explore Staten Island on two wheels. How will this plan incorporate safe space for bike transportation? Oh, “kind of hoping”, that sounds good enough to base a multimillion-dollar plan around. I can just imagine what that big ferris wheel and all that parking will look like after the next hurricane. And if we can believe Gov. Cuomo’s statement yesterday there will be another hurricane. I’m having trouble getting too upset about this. The location is at a well-designed, recently re-built multi-modal transit hub (ferry, buses, SIRT). It doesn’t interfere with a proposed bus-way, one that is yet unfunded. Is there lots of parking? Sure, but until that bus-way gets completed, I think that most of the transit to this destination is already at capacity, so you’re not going to encourage more driving. If anything, if it is easier for commuters to take the ferry into Manhattan because they can get parking more easily, it might alleviate traffic in the city a little by discouraging those drivers. Can Brooklyn Build a Pedestrian-Friendly Arena at the Atlantic Yards Site? How Long Will NYC Let Parking Mandates Stand in the Way of Affordability? One year after Mayor de Blasio's affordable housing reforms reduced some parking requirements, momentum is building to finish the job.